The 80/20 Rule has been one of the most helpful concepts for my time and life management. Also called the “Pareto Principle” after the Italian economist, Pareto recognized that people in his society were divided into two groups: The “vital few” were the top 20 percent in terms of money and influence, and the “trivial many” were the bottom 80 percent. Bottom 80 percent? That’s harsh! He also discovered that just about all economic activity operated by the same principle as well. For instance, the principle states that 20 percent of one’s activities will account for 80 percent of their results; 20 percent of customers account for 80 percent of sales; 20 percent of products account for 80 percent of profits; 20 percent of our tasks will account for 80 percent of the value of what we do. Basically, if you have a list of 10 items to do, two of those items will be worth 5-10 times more than the other eight put together. If you think about it, you know this to be true! Each of the ten tasks mentioned above may take the same amount of time to accomplish. However, one or two of the tasks will contribute 5-10 times the value of the others. Many times, I have found that one item on my to-do list will be worth more than the other 9 items combined. Don’t you think this is the first item I should try to complete? However, this one item is normally the item that the average person is most likely to procrastinate. Most people procrastinate the top 10-20 percent of items that are most important. 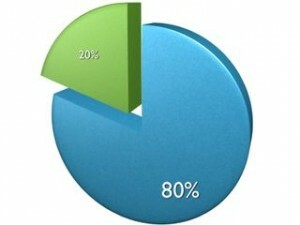 The other 80 percent (the “trivial many”) contribute very little to real results. You know that co-worker who appears to be busy all day long but never seems to accomplish anything? This is because they are working on tasks of low value while procrastinating on the one or two activities that could make a huge difference in their career. If only they focused on the “vital few”, they would be in great shape. Resist the urge to clear up small things first, or you will spend your entire day doing small things. This is the crazy (and wonderful) thing about habits: whatever you choose to do over and over again becomes a habit. Habits are hard to break, but you can always build a new habit on top of an old one. You do not want to build a habit of starting your day working on low-value tasks. The hardest part of an important task is getting started on it. Once you start a valuable task, you will motivate yourself to continue. It is fun to work on a task that you know will make a huge difference. Get used to doing this, and it will become a habit. Think about how you felt when you completed an important task in the past. Felt good, right? Just thinking about starting and finishing a huge task motivates you and helps you overcome procrastination. Many times, the amount of time it takes to complete an important task is the same time it takes to complete an unimportant one. The difference is the feeling of accomplishment and pride in completing something that makes a difference. Time management is all about controlling what you do, and in what order. Success comes with deciding what the important and unimportant tasks are in your life. The most successful and productive people discipline themselves to start with the most important task. They force themselves to stick with it, thus accomplishing more than the average person. We should all attempt to work this way as well!